A few days ago President Obama spoke about religious freedom, declaring January 16, 2017 Religious Freedom Day. Last year, lawmakers in many states across the country have pushed for the adoption of so-called “religious freedom” bills, thinly veiled attempts to make it easier for businesses or individuals to discriminate against other Americans based on their sexual orientation and gender identity. The ideas expressed in these bills are a distortion of religious freedom – and they undermine another important value we all cherish: treating others as we ourselves would like to be treated. 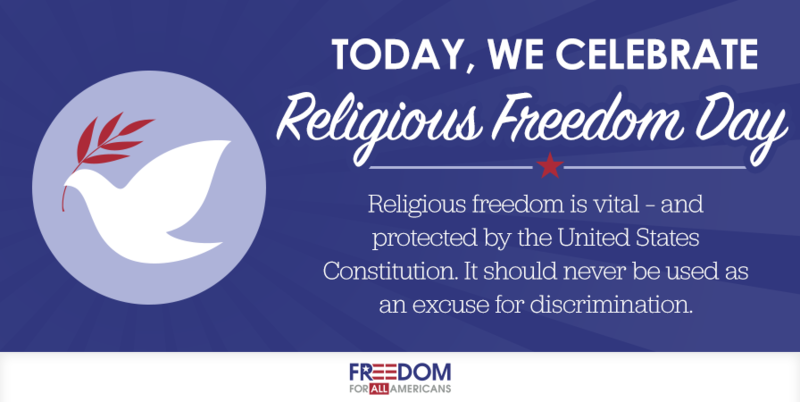 The freedom of religion should be celebrated as a fundamental right, something vital for all people in our country – but it should never be used as a weapon, something explicitly and specifically leveraged to harm a class of people or make discrimination easier. Learn more about the many people of faith who support comprehensive LGBT non-discrimination protections. And read more about how so-called “religious freedom restoration” laws have real consequences for all Americans.